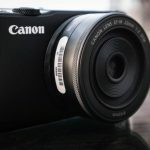 Home / Digital Camera Comparison / Canon EOS M50 vs. EOS M100 vs. EOS M6/M5: What’s the difference? The Canon EOS M50 is ringing in a new era. Sony, Fuji, Panasonic and Olympus have been counting on mirrorless system cameras for a long time. So far, Canon has only been in this market segment with the handbrake on. Now, that (may be) changing. Canon wants to unlock the competition with the EOS M50. My test will show whether they have succeeded or not. Although the camera is only an entry-level model, it shows off with its features, and rightly so – considering other Canon products. Instead of going through the pros and cons of the EOS M50 individually, I decided to compare it with the cheaper M100 and slightly more expensive M6. The M50 fits perfectly in between these cameras and is a successful evolution of the EOS M system. In principle, the Canon EOS M5 is an EOS M6 with a viewfinder and a foldable display which is a little hard to get used to (it folds down rather than up). Apart from these two points, you can carry over everything else about the M6 to the M5. As such, I do not talk about this camera explicitly. Nobody would say that any of these cameras are big or heavy. In terms of weight, there is absolutely nothing to complain about. In terms of size, however, the size of the M50 viewfinder is noticeable. This is not only from the top, but also the back. Both are logical and have to be there. In practice, it makes the camera noticeably bigger than it actually is. It is not as easy to simply put the M50 in your coat pocket as you can with the M6 or even the M100. That is the price of the viewfinder. The EOS M50 and M6 both fit in your hand nicely thanks to a rubberised grip. The M100, in this respect, does not – no rubber, no grip, nothing! In terms of material, the M6 feels more valuable than the M50. The front wheel also feels better to use. The M50 and M100 feel like plastic, which makes them not look as solid. At least the grip and area for your thumbs on the back have been rubberised on the M50. My favourite for this category is the M6, but this is of course only if you can live without the viewfinder. There is not much that needs to be said here, the numbers speak for themselves and coincide with my experiences. The M50 looks strikingly old in this area. To make matters worse, none of the cameras can be charged via USB and original Canon batteries are ridiculously expensive. One point for the EOS M6. Meanwhile, the sensors are so good that it does not make much difference which model you buy. There are, however, major discrepancies in their operation. For me, the operation was even the deciding factor to switch back to Canon from Sony. There are also differences between the EOS M100, M50 and M6 in terms of operation. I can give this point to the EOS M6 straight away without even counting. Neither the M50 nor the M100 are so easy to use. I took me quite a while to get used to the minimalism of the M100. I eventually got the hang of it though and had to admit that this camera is also easy to use. It is noticeably better on the M50 but it cannot replace the haptic buttons and wheels. Another point for the M6. The M50 finally has a menu with instructions, which I already knew from the 200D. For an entry-level model it is great, but for an expert like me it is barely anything, so I have changed it back to the classical version under Display Level -> Menu display. What is also great for beginners is the automatic mode on the EOS M50. You can use it to adjust simple things like out-of-focus backgrounds, brightness, contrast, saturation and so on. You can even influence the colour of the photos. Generally, the menu has been ordered a little more logically. Basic settings such as the configuration of keys can now be found in SETUP Menu instead of SHOOT-Menu. Very logical! One point for the M50! The M50 and M6 get an extra point each for MyMenu. With it, you can place frequently used menu items to the centre so that you can access it quicker. The M100 does not have MyMenu and I actually miss it! Really, an electronic spirit level should now be built into every camera. After all, there is nothing uglier than a slanted horizon. The M50 and M6 have such a spirit level, the M100 does not. But beware with the EOS M50! The spirit level does not work in automatic mode [for whatever reason] or when you have selected the facial recognition and tracking AF methods. The display on the M100 can flip up to 180° upwards. On the M6 it also flips 45° downwards. Both cameras cannot do any more than this. 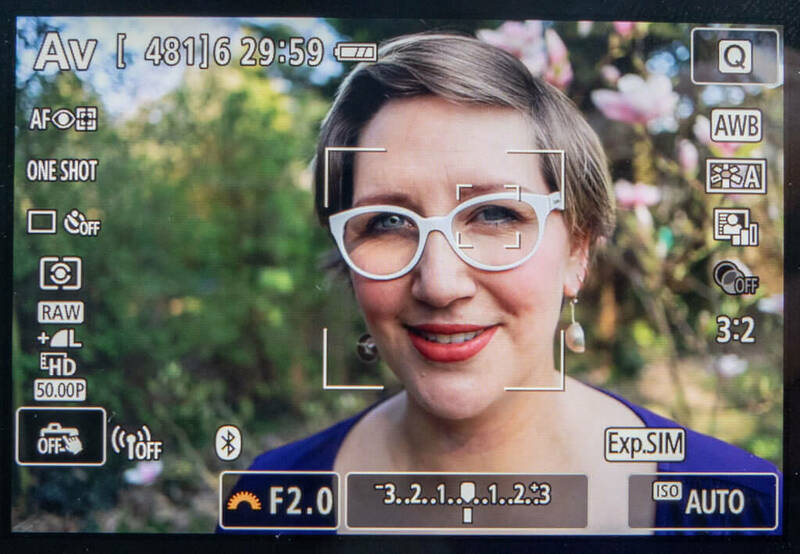 Canon has given the EOS M50 a completely pivotable display. That means that you can look at the display from almost every position. The biggest advantage of this is that you can also open the display in portrait and close it to protect it from damage during transport. Personally, I like the folding display on the M6 more, as you basically look through the lens when the display is closed too, and it does not look so great in videos and selfies if you’re looking at the display instead of the objective. But that is my personal opinion. Objectively speaking, the M50 pivotable display is better. Taking pictures with a viewfinder is an acquired taste. It definitely does not hurt to have one, though. The EOS M100 does not have one; for the M6 you need to equip it yourself; and it is firmly built-in on the M50. Definitely a point for the M50! The finder for the M6 could indeed solve the size problem from the top, but it is excessively expensive. I actually like the loud shutter sound when triggering the camera. Only real cameras do that. But, there are situations where it is just not appropriate. For example, when you want to discreetly take a snapshot somewhere or if you want to take pictures in a church. As the first ever EOS M, you can do this with the M50 in silent mode – in German: Leiser Modus. What’s stupid, though, is that silent mode only works in one type of automatic mode. You can change the AF method. ISO, blending and exposure time are chosen by the camera itself. There is indeed a brightness control, which works similarly to the brightness corrector, but you have to awkwardly find it in the Q Menu. Better than nothing! The camera reaction times are also a part of the operation of the camera. Until now, the EOS M series were really chilled-out cameras which sometimes took their time. The M50 is not insanely faster, but one or two things are definitely better. For example, you can make adjustments to camera settings whilst pictures are being saved onto the camera and quickly proceed to take another picture. Depending on the setting, you had to wait a long while to do this on the older EOS M cameras. The sensor is not noticeably better, but the already quite good dual pixel auto focus has been improved again. It is supposed to be better at tracking… I have not noticed anything specifically, probably because the M100 and M6 are already good in this area. What is new, though, is that the focus fields cover a greater area and amongst all else, there are more fields. The number and the area covered varies from lens to lens. Sometimes it’s 143, sometimes it’s 99. Regardless of how, there are more than the 49 that are on the M6/M5/M100. In my eyes, the biggest advantage is that you can choose a smaller field in the single field AF and can focus even more accurately (unfortunately, this only works with ONE SHOT). At the same time there is also an eye AF. That is the next level of facial recognition. The camera uses it to focus directly on the eyes. You can activate the eye AF under SHOOT6 -> AF eye recognition. Warning: Unfortunately, this only works when you use facial recognition + tracking and ONE SHOT together. The eye AF therefore cannot be tracked. A further innovation in an EOS M is the dual sensing IS. The camera uses data from the gyroscope and sensor to control the image stabiliser of the lens. If it does do that, it only does it a veerrryy veerrryyy little bit. I tried it with photos and videos and I am not convinced. That’s why there are no points awarded for this category. The M50 also does not have sensor-based stabilisation. The pictures are only optically stabilised when you use an appropriate lens. The new stabiliser should also have an impact on video recordings, but again I do not see any real difference. The Canon EOS M50 shines – as do the M100 and M6 – with recordings in 1080p with a maximum of 50-60 frames/sec. This is where the terrific dual pixel auto focus comes in, which most of the time fits perfectly and delivers good video material. In addition, with the M50 you can record videos at a resolution of 3840×2160, in 4K. However, this only works with 24-25 frames/second and without the dual pixel AF. It also has a hefty crop, so you’ll either need a super-wide-angle lens or simply use the 4K mode as a teleconverter. The 4K features are the only reason why I would not buy the camera, but of course it does not hurt. Unsurprisingly, you can only choose 4K when the mode dial is on the movie camera. The M50 can also record a time lapse in 4K. Additionally, you now have more influence over the settings, like aperture and exposure time. Unfortunately, the maximum exposure time is 1/25 seconds in time lapse and you can leave the camera running for a maximum of 1 hour. There is also a hefty 4K crop in time lapse mode. Another innovation from the M50 is that you can film in 720p with up to 120 frames/second, more or less creating beautiful slow motion videos. More or less, because 720p sounds like a joke in 2018. There is also no sound or auto tracking. The auto ISO curiosity of the EOS M system also breaks through the canon EOS M50. The range is now in full HD from ISO 100 – ISO 12,800. You can even film with ISO 25,600 manually. In 4K, ISO 6,400 is the cut off point, as with the M6 and M100. The bottom line is that I find the video features on the M50 particularly below par. I can only see the 4K without dual pixel AF and with the fierce crop as a nice bonus. I could not work with it all the time. I feel the same way about the slow motion. The time lapse function itself makes me envious as the owner of an M6, but other cameras offer more. Nevertheless, the point for video definitely goes to the EOS M50. For me, it is the best EOS M for videos. The EOS M50, as well as the M6, have an accessory shoe, USB, microphone input and HDMI output. The M6 also has a small hole for a cable remote control. The M100 has neither an accessory shoe nor a microphone input. None of the cameras have a headphone output. That would be a slight edge for the M6, BUT: the slot for the SD card on the M6 and M50 is at the bottom with the battery, on the M100 it is on the side. This is a much better solution, as you can change the cards if a quick-release plate is screwed onto the camera. It’s just stupid that none of the cameras can be charged via USB, which means that you often have to open the battery case. The Canon smartphone app is not particularly good, but the M50 gets the most out of it. Firstly, you can only begin film recordings over the app on the M50; secondly, you can use it to transfer photos directly to your smartphone. You can also connect the camera to WiFi and access it from other devices. If you want, you can also write the location information of your smartphone onto the EXIF data via Bluetooth. You cannot do that on the M6/M100. On those, you have to log everything first and then write all the data onto the pictures in one go. Even though I do not find the app very successful, this point still goes to the M50. None of the cameras have a panorama mode, and your search for the star-time-lapse mode from the GxX series will come to no avail, either. Instead, there is a creative assistant in every EOS M and a few more or less useful scenic modes, such as sport. The M50 and M6 can do bracketing. With the M100 you cannot do this automatically. None of the cameras can shoot a series of focussed pictures. Damn Canon, what on earth is this? The M50 is definitely an announcement and shows that you heard the shot. I do not understand why those exact features were chosen (e.g. why does the entry-level model EOS M50 shoot faster consecutive shots than the professional camera EOS 5D Mark IV? ), but that doesn’t really matter. It took me a long while to get used to the EOS M system, but in the mean time I like it and I also like the M50. Canon sells a lot of cameras for a good price. Despite everything, the M50 is still just an entry-level model which was stingy with buttons and wheels. The operation is good and thought through but is nothing over an EOS M6 or M5. The remaining features of the M50 are at least on par or even better than those of their bigger sisters. All of that can be seen on paper. The M5, M6 and M100 are all good cameras and the M50 puts another shovel on top. Bravo! But has Canon caught up with the competition? For me, the main competitor is the Sony a6000 and a6300. I do not see Panasonic and Olympus as competitors. The cameras either lack the phase comparison AF or they play in another price range. In addition, the sensor is once again a great deal smaller. Although Fuji has the X-E3 in its programme, it does not have the folding display and input for an external microphone, so they have lost the “vlogger” target group. The Sony a6000 does not have any of these features. That’s why the price is super attractive and a good choice for an entry-level model. For videos I would definitely prefer he M50 over the a6000 and I also think the Canon is better for photos. It’s a different picture for the Sony a6300, though. Especially with its video features, the camera is presents itself well, with 4K with phase comparison AF, 120 fps slow motion in 1080p and SLog picture profiles. That’s why the price is noticeably more expensive, it does not have a touchscreen and the display is not pivotable. In that sense, the a6300 is also no real competition for the M50. Actually, the M50 is unrivalled in its class. If anything, there is competition in-house. I give it a thumbs up and would recommend buying it. Why am I not buying a Canon EOS M50? You might be asking yourself why I am not buying a Canon EOS M50 for myself, despite finding the camera so great. I myself have an EOS M6 and an M100 and I am happy with them. With its many wheels and super compact design, the M6 is close to my heart. It can be used so quickly and directly and without having to use the touchscreen for long. I find that great and the M50 was a long way away from this. The M100 is my B-roll and second camera, and for that it is already too big. A G1X Mark III would be better, but it is too expensive for me. All the features that the M50 offers are ones that I do not actually need, and it is also much bigger. With this in mind, there is not necessarily a reason to change cameras. Nonetheless: If I didn’t already have the M100, I would get the EOS M50 instead, mainly because of the 4K “teleconverter” and the expanded time lapse function. But really, I do not need it often enough and apart from that, there is also a solution for his in my camera fleet: the Lumix LX15 can do all of that and even a few more things. So, I am well equipped without the M50. However, if an EOS M6 Mark II were to come out soon, with the features of the M50… what do you think? Would I buy it? 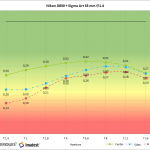 Next Photo lab – The Nikon D850 vs.the D810 vs. Sony A7R II vs. Canon EOS 5DsR, which is better? Canon EOS 70D vs 7D vs 7D Mark II, what’s the difference?